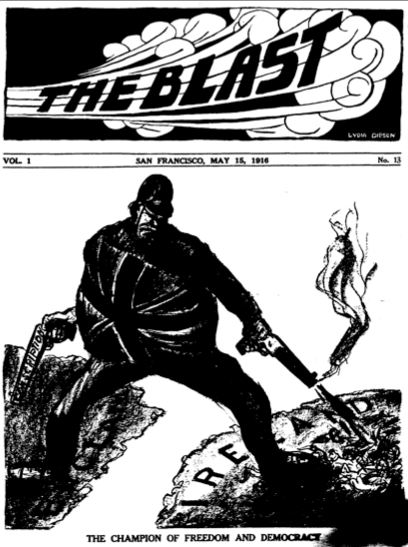 After nearly 130 years of production, the anarchist newspaper Freedom moved its operations online last year. Sadly unable to sustain a regular printed publication in this era, the East London-based Freedom Press now publishes its news and opinions on the web accompanied by a quarterly freesheet and a monthly email digest. 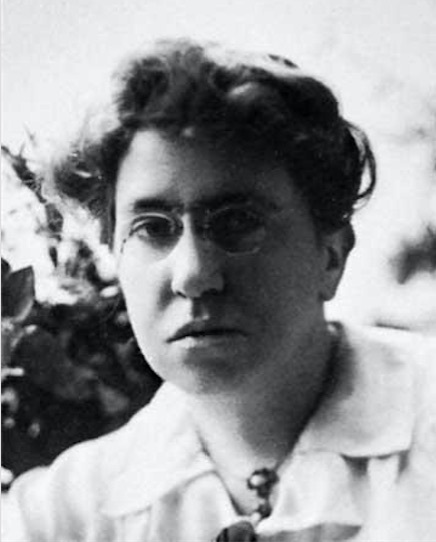 From 1886 to 2014, it was the stalwart organ of the English-speaking anarchist movement and could boast of links with some of the world’s foremost anarchist thinkers including Peter Kropokin, Marie-Louise Berneri and Colin Ward. 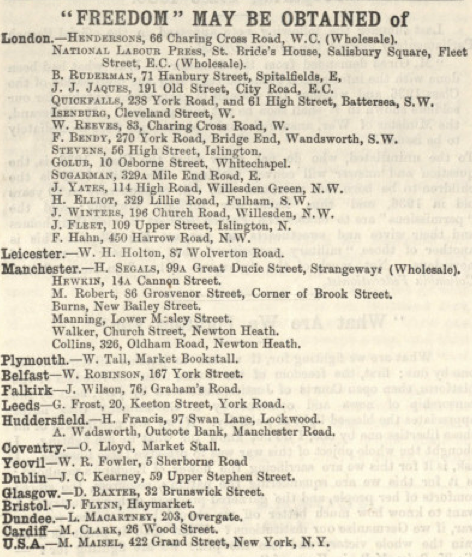 While reading a copy of Freedom (sub-titled the “Journal of Anarchist Communism”) from March 1916 on the Libcom website, I was pleasantly surprised to discover that along with major cities like London, Manchester, Glasgow and smaller ones such as Plymouth, Yeovil and Falkirk – names and addresses of Freedom newspaper sellers are listed for Dublin and Belfast. Jospeh C. Kearney (c. 1887 to 1946) was a bookseller and stationer who lived above his shop at 59 Upper Stephen Street his whole life. There are a small number of fleeting references to him and his family online. I think it could be assumed that he had some sympathy to socialist or anarchist politics he was happy to both stock Freedom and let the newspaper publicly advertise the fact. In 1901, Joseph C. Kearney (14) was living at home with his widow mother Lilly Kearney (38) nee Walsh and two younger brothers Thomas (11) and Alfred (10). Lily was a tobacconist and employed an assistant, Mary Callaghan (19) from Cork, in the shop downstairs. Obviously reasonably financially well off, the family also enjoyed the services of a servant Ellen Byrne (16) from Carlow. On the first anniversary of her death, a notice was put into The Freeman’s Journal (4 December 1891) in memory of a Mrs Anne Walsh of 59 Upper Stephen Street . I suspect this was Lilly’s mother. The Kearney family put an advertisement in the Freeman’s Journal (8 March 1902) looking for a “respectable, strong, young country girl” to work as a general servant. They inserted similar notices in 1904 and 1911. The family were decidedly middle-class. By 1911, Lily (50) had re-married a Royal Dublin Fusiliers Army Pensioner by the name of Vincent Walter (60). Her three sons Joseph (24), Thomas (22) and Alfred (20) all still lived at home with her and listed their profession as “News agent shop men”. Lily’s brother Alfred Walsh (52), an “Engine Fitter”, and a cousin Louie Wilson (16), a “Drapers Shop Assistant” from Liverpool also lived in the house at that time. 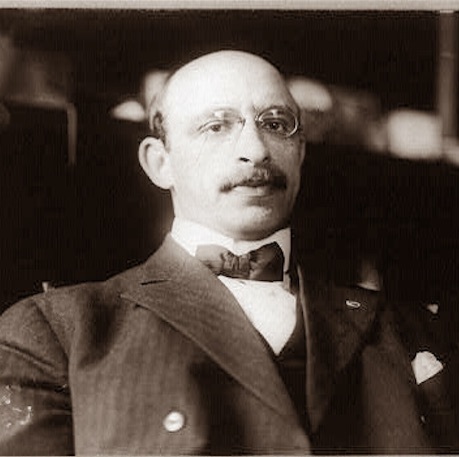 In August 1918, Joseph C. Kearney was fined after his wife Louisa Kearney illegally sold matches to a customer. It was the first prosecution, according to the Irish Examiner (28 August 1918), under a new act which “provided that matches must be sold in boxes and not in bundles under any circumstances”. On 23 February 1922, a notice was put into the Irish Independent by Lily Kearney-Walter who then living in California, San Francisco to mark the 5th anniversary of the death of her brother Alfred. Lily obviously moved back home as she died in Harold’s Cross Hospice on 6 June 1924. The notice in the Irish Independent (9 June 1924) mentioned her late husband V.B. Walter was late of the SMRASC which I think stood for Service Member (?) Royal Army Service Corps. Kearney had another brush with the law but this time for more interesting reasons than selling matches. 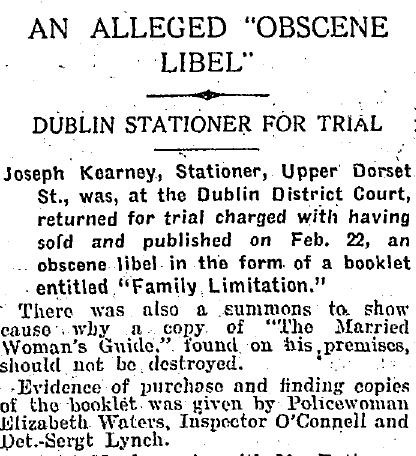 In April 1928, Joseph C. Kearney was found guilty and fined a total of £60 for selling two “obscene” publications entitled “Family Limitation” and “The Married Women’s Guide”. It could be concluded from this that Kearney was still politically inclined. Joseph C. Kearney tragically lost his wife and two children in the 1920s and 1930s. His wife Louisa Kearney died on 8th October 1923. Emily Lousia, his second daughter, passed away on 10 March 1939 aged 22 and was buried in Glasnevin cemetery. His youngest son Vincent Joseph Kearney died on 24th February 1936 aged 15 after a short illness. Joseph C Kearney himself died on 29 January 1946 and was buried in Glasnevin with his family. 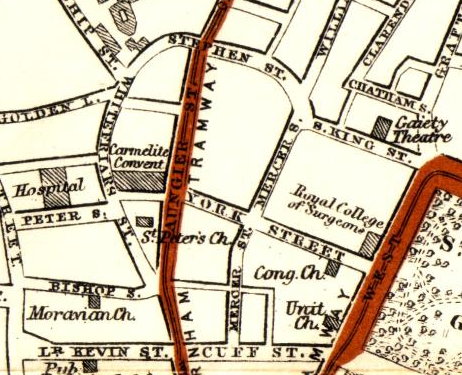 After his death, the newsagent at 59 Upper Stephen Street was taken over by a P. Smyth. 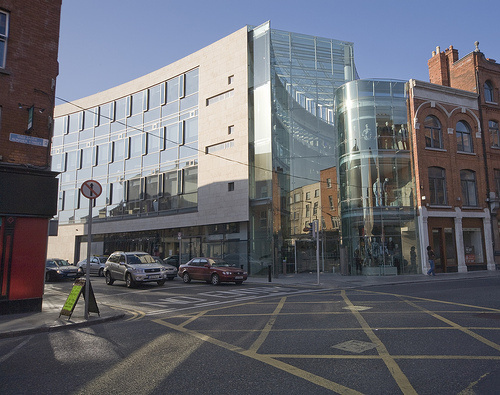 This house and that whole row at the corner of Upper Stephen Street and South Great George’s Street was demolished and replaced by a modern office block (Dunnes Stores head office) in 2007. From the Bulletin of the Society for the Study of Labour History (no.47, Autumn 1983) we have a report of Belfast anarchists being represented at the 1912 Anarchist conference in Leeds. Other than a mention that at least one delegate was present from Belfast, we have no further information about whether a functioning anarchist group was being represented, nor who the delegate was. Any further information will be welcomed. The report here is the one given to the Leeds Jewish Anarchist Group by its delegate. We do know that there were anarchists in Belfast at that time. John McAra, a Scottish anarchist spoke from the steps of the Custom House in 1908, which saw him arrested, charged with sedition and then jailed for three months. This was considered newsworthy enough to be reported in the Kentucky Irish American newspaper of Saturday, April 4, 1908. The Belfast anarchist group which formed at this time appears to have died away after the First World War.